'We're going to figure this out,' Gov. Rick Scott tells national TV audiences. Shaken by the mass killings at a Broward high school, Gov. 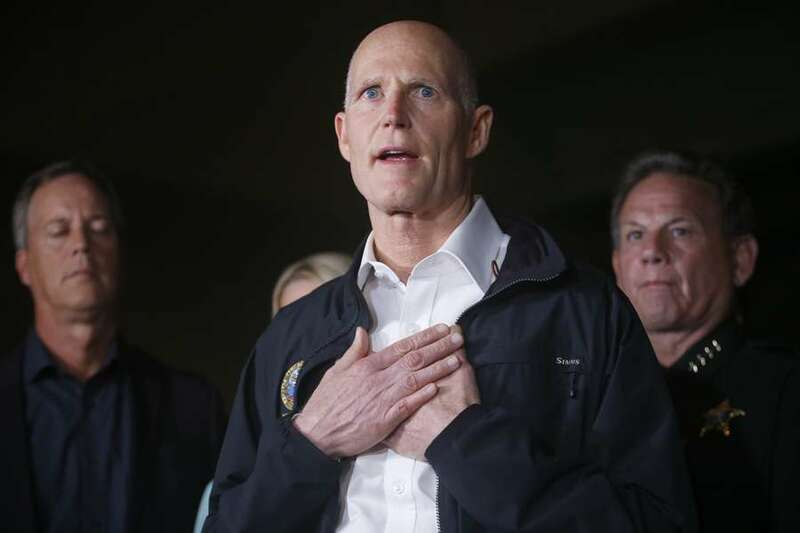 Rick Scott and legislative leaders say they will shift more money and policy to mental health and school safety, but as with earlier Florida gun tragedies, the Republicans skirted talk of stricter gun laws. The day after 17 people died in a barrage of gunfire at Marjory Stoneman Douglas High in Parkland, Scott sought assurances from House Speaker Richard Corcoran and Senate President Joe Negron to focus on campus security and steering more money to school-related mental health treatment. "Something has to change here," Scott said on Fox & Friends. "We cannot continue to have this violence. We've got to keep our students safe." In Florida, little changed after two previous mass shootings at Orlando's Pulse nightclub in June 2016 and at Fort Lauderdale's airport in January 2017. This time the response may be different because the killings happened at a school in the middle of a legislative session in an election year. The first sign of change came when a powerful senator, Rob Bradley, the appropriations chairman, said he won't hear any gun bills this session unless they deal with denying guns to people who are mentally ill.
"I'm looking for solutions," Bradley said, rejecting a bill that relaxes background check requirements for some people applying for concealed weapons licenses, which had been championed by Commissioner of Agriculture Adam Putnam, a leading GOP candidate for governor. What likely won't change are Florida laws that allow teenagers such as Nikolas Cruz to purchase powerful semi-automatic weapons with extended magazines without a waiting period. Federal authorities confirmed that the 19-year-old Cruz bought an AR-15-style rifle legally. Democrats say the violence is a result of easy access to guns. "You know what's going to happen after this? Nothing," said Rep. Jared Moskowitz, D-Coral Springs, a 1999 graduate of Stoneman Douglas High who represents Parkland. "Politicians need to look these parents in the face and say: We will do nothing." Democratic lawmakers demanded that schools be required to have at least one sworn law enforcement officer in every school during school hours. "It's crucial that we do more than speak about solutions," said Rep. Joe Geller, D-Aventura. "We must act quickly and effectively." Negron said he welcomed ideas from all five Democratic senators who represent Broward to make "enhancements" to school safety and to make sure that mental health treatment is available for people who are in need of that. He made no mention of reviewing state laws that allow 18-year-olds to buy semi-automatic weapons without a three-day waiting period. To buy a handgun in Florida, a buyer must be 21 and wait three days. Corcoran, a Republican who may run for governor, did not respond to a request for comment and two carefully worded tweets stopped short of endorsing more mental health money. He tweeted: "We will work together to make a significant investment in school safety (and) engage in a conversation" about mental health. Scott and his fellow Republicans who control the Legislature did not propose new gun laws or seek significant mental health funding increases after the Pulse nightclub massacre in Orlando in 2016, where a gunman took 49 lives. The state hired several dozen terrorism experts after the Pulse massacre, which state authorities called an act of terror. Not much happened in Tallahassee after the mass shooting 13 months ago at the Fort Lauderdale airport, where five lives were lost. Scott's office cited his support for yearly increases to a Safe Schools program starting in 2012 and a requirement that schools prioritize the stationing of resource officers in schools. As authorities continued to notify victims' families Thursday and 14 people were being treated for gunshot wounds, Scott said: "If somebody's mentally ill, they should not have access to a gun." Scott said almost those identical words in January of last year, after the Fort Lauderdale airport shooting. And when the Broward school superintendent, Robert Runcie called Thursday for action to curb gun violence in Florida, Scott, standing alongside, said nothing. The two-term Republican governor is considered a likely candidate for the U.S. Senate next fall. For the second legislative session in a row, Republican legislative leaders show little or no interest on either side of Florida's perennial debate over guns. In a compressed 60-day session, lawmakers have found time to debate specialty license tags, daylight saving time, changing the local election calendar and outlawing so-called sanctuary cities. Scores of bills dealing with gun regulation were filed for the current session, now in its sixth week. Most won't be heard. Six months ago, Sen. Linda Stewart, an Orlando Democrat, filed a bill (SB 196) to ban semi-automatic weapons and large-capacity magazines. She also filed it a year earlier, after the Pulse massacre. "It got nowhere," Stewart said. "Nothing's getting resolved." After the mass shooting in Las Vegas last fall, Stewart filed a bill to ban the use of so-called bump stocks that give semi-automatic weapons more rapid-fire capability. That bill, too, has gone nowhere. Asked why Stewart's bills were ignored, Negron said his focus was on making sure that mentally ill people don't have access to guns, and that schools are made as safe as possible. "What's important is, we want our students to be safe," Negron said. At least three pro-gun bills were defeated in Senate committees that dealt with concealed weapons issues. In all three cases, a deciding vote was cast by Sen. Anitere Flores, a moderate Republican from Miami. "I have yet to be convinced of the purpose of these multiple magazines," Flores said. But barring a major shift in philosophy by Republicans in the next three weeks, the session will end with no new gun regulations. After the Pulse shooting, Democrats signed petitions to demand that Republicans call a special session to review gun laws, but it was ignored. During the session that followed, 24 gun bills were filed and the only one that passed expanded gun owners' rights. Despite that, the National Rifle Association has struck out in efforts to expand gun rights on college campuses, churches and courthouses. The pro-gun rhetoric of Republicans hasn't changed but several lawmakers told the Times/Herald they were willing to consider changes to ensure that people with mental illnesses can't get weapons. "It's not working when a maniacal person with all these flags can buy a weapon and cause this tragedy,'' said Sen. Bill Galvano, R-Bradenton. "It doesn't take a psychologist to recognize these signs. Some things are so visceral that even a lay person like me knows it's wrong." The shooting has also forced lawmakers to do something they have long neglected: focus discussion on the need for more school-based mental health counselors. House Democrats sent Corcoran a letter urging support for more safety officers and mental health money, and a handful of Republicans said they supported it as well. "I raise my hand. I'll give up all my appropriations in our House budget — and that's like $9 or $10 million,'' said Rep. Frank White, R-Pensacola. "I think if you were going to ask every other member, we're all going to do it. That's the kind of stuff we need." Times/Herald staff writers Elizabeth Koh, Emily L. Mahoney and Lawrence Mower contributed to this report. Information from The New York Times was used. Contact Steve Bousquet at [email protected] and follow @stevebousquet. This is (INAUDIBLE) happen anywhere in our country. The first thing you think about is you just can't imagine what these families are going through. The families are still waiting to find out what happened to their loved ones. The most important thing we can do right now as law as enforcement is doing their job and health care workers are doing everything they can for the victims, is pray for everybody. Thank God we have the law enforcement we have at the states, the Orange County police department, the sheriff's department, FDLE, all the federal agencies, everybody's coordinated their activities very well. It's heroic, the individuals that went in to the building knowing there was an active shooter. So we need to be very thankful that there were individual there is willing to risk their lives to save other lives and they clearly saved other lives. For anybody that thinks that they should do this, I can tell you the state of Florida, the local law enforcement will be swift in their justice. We have great law enforcement in our state and they'll going to always do the right thing. I declared a state of emergency for Orange County. We're going to provide all the resources that anyone needs and I can tell you everybody is going to work together and that's one thing great about our state, Orlando, Orange County. And I want to thank all the federal agencies for all their support. But right now, our hearts and prayers go out to everybody that’s been impacted. I can’t imagine family member that is still waiting to find out what happened to their loved one, it has to be heart wrenching. UNIDENTIFIED MALE: Would that make you change your views? Would you back any kind of gun legislation or restrictions on gun purchases, anything like that? SCOTT: Right now we are — this is the time to find out exactly what happened, a time to pray for those that have been — that have lost their families, have lost their lives. Pray for the victims. There will be plenty of time to deal with how our society comes together. UNIDENTIFIED FEMALE: (INAUDIBLE) stop something like this (INAUDIBLE)? SCOTT: I talked to a dad. He didn't want to talk about his son they lost. He said this has to stop. We have to think about how we're going to share information, how we're going to destroy ISIS. I mean, the stories — just talked to — I talked to a family who thought their son was dead and just found out he was alive. I talked to a young man who has three gunshot wounds in his back and he just feels so lucky and his family that he's alive…. But you know, Brian, here's the deal. If not now, when are we going to take this seriously? This is an attack on Orlando, a gay nightclub, it's attack on gays, attack on Hispanics, attack on our country. When are we going to say enough is enough and say we are absolutely going to destroy ISIS, we're going to stop the evil of radical Islam? We've got to — at some point say (inaudible). Is 49 enough? How many more can there be? BRIAN KILMEADE (Fox News): Well, I mean, you tell that to the people at San Bernardino, tell the people at Fort Hood, you know tell the people that see the ISIS threat here and the president of the United States does not see it that way. He was talking about guns yesterday, why is it so easy to get an AR-15, and on Thursday I imagine that will be the case. Has the president spoken to you yet? SCOTT: No. He has not called — a staffer's called, but no, he has not called. But — the second amendment didn't kill anybody. Evil, radical Islam, ISIS, they killed. We have got to start standing up for this country. This is our country. We have to say we're going to vet people before they come into our country. If you disagree with our — what our country believes in, why in the living daylights are you allowed in our country? We have 49 people dead, dead, murdered, right here. 43 people in the hospital still — I was at the hospital (inaudible) — still having surgeries. They're not sure they're going to live. When do we stop this? KILMEADE: Donald Trump called you yesterday. That sounds like he would agree with you on that. SCOTT: Well, I mean, he called, he called to just say — ask how I was doing, say, you know, he — like everybody else is praying for us. But you know, I am fed up. You go talk to these families and you just listen — I mean, you just — mom (ph) giving her a hug while she was crying about her son knowing he'd bled death. He had three gunshot wounds and he bled to death and there was a young lady trying to save him and couldn't. KILMEADE: Well, Governor, they're cheering somewhere and that's in the Islamic State and that's who he pledged allegiance to on the 911 call while he was doing it, yet we're seemed to be focusing on guns. SCOTT: If not now, when? "I think one thing we have to think about is if someone is adjudicated mentally ill, it just doesn't make any sense that they should have access to a gun," Scott said at a press conference Thursday in Fort Lauderdale in response to a question about increasing airport security in the wake of the shooting. SCOTT: This is just a despicable, evil act. Think about these innocent people coming in on a flight. According to law enforcement, we have lost five lives here. We have people in our hospitals fighting for their life. BLITZER: Do you believe, Governor, that airports in Florida — and, as we know, those airports are huge. A lot of tourists coming in, a lot of Floridians using those airports. But actually airports around the country as well need to rethink how they approach security, specifically at baggage claim?